What can I do to prevent and reduce the chances of fire damage in my home? Summer time brings families together in kitchens and clustered around smoking grills. Because of the influx of corn on the cob, brats and burgers, kitchen and grill fires are more prominent this time of year. Make sure to keep a watchful eye when cooking this season. Here are some tips to preventing your house and dogs from fire damage this summer. Kitchen fires are the most common cause of home structure fires. This is most prominent because homeowners are generally the ones to try and put it out. This often enough makes the fire worse causing more fire damage. The best way to fight kitchen fires is to prevent them all together. – First thing to remember is to keep a watchful eye on the items you are cooking. Over heating and boiling liquids can create problems in just a few seconds. Knowing temperatures and timers will allow you to judge the safest cooking experience. – Keep in mind the items around you stovetop. Towels, potholders, plastics and any other loose articles can easily catch on fire. Make sure your counters are clear before you start the stove. – Clothing can always catch on fire as well. Make sure your sleeves are rolled up and skirts are accounted for. Cotton and especially synthetic materials can easily catch fire. This is where Stop, Drop and Roll comes into play. Running around the kitchen will worsen the flames. This also goes with hair. Ladies, (and some men) make sure to tie back your hair. I am sure you didn’t want a spontaneous hair cut that day. Grease fires can be some of the worst and the hardest to put out. – Use a thermometer to control the temperature. If you start to see smoke, turn the heat off. – First off, never throw hot oil into a garbage can. The temperature of grease far exceeds the temperature of boiling water. You may not be familiar with all that is in your garbage, thus creating larger problems and larger flames. – Never use water to put out a grease fire. Water does not mix with oil, it can splash and spread the fire further causing more fire damage. – Turn the heat off. The primary source of heat needs to be turned off if you want to keep the oil under control. – Cover the pot with a lid. Fire cannot survive without oxygen. If the oxygen supply is cut off, you can contain the fire. Being an American past time, grilling is a weekly thing for most families in the summer. Grilling safety is always important to keep in mind. It is said that gas grills cause almost 6 times the amount of fires compares to solid-fueled grills (charcoal). – Always keep your grill a safe distance form your home. If you grill does catch on fire, it is netter to lose you grill than your home. – Like stated before, keep an eye on food and heat levels, flare-ups are common in most grills. – It is always a good idea to keep a splatter mat underneath the grill, especially when your grill is on a patio or deck connected to your home. -Always place a fire extinguisher around kitchens and grills, and make sure you know how to use them! Knowing how to put out a fire quickly will prevent extensive fire damage. 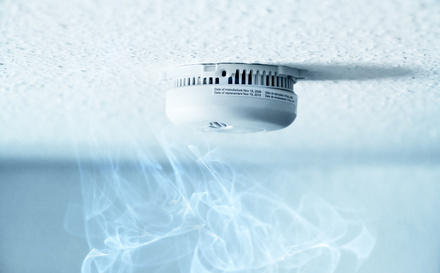 – Always replace batteries in your smoke detectors. They should be tested once a month to make sure they are always working. – Make sure the family knows of an exit plan. House fires can be very unexpected and your whole family should be aware of an exit plan. Read and print out this handy safety sheet from the California Department of Forestry and Fire Protection to keep around your kitchen and grills. It can help children better learn the importance of fire safety. In case of larger house fires, make sure to have a professional clean and restore your home. Smoke and soot is extremely hard to clean and can cause further damage if cleaned on your own. Find a local fire restoration provider near you.